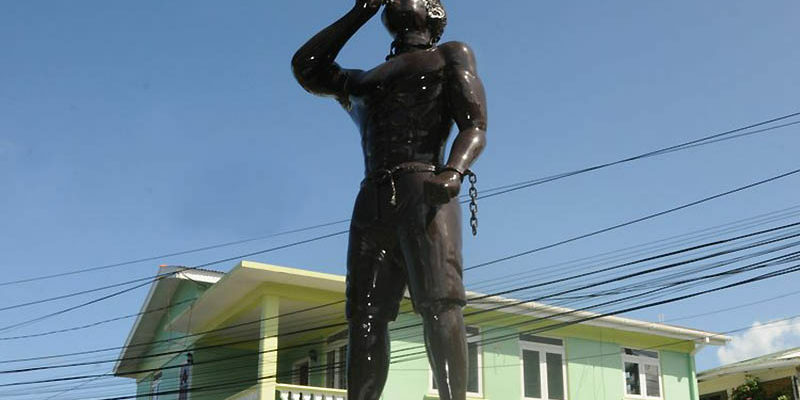 On August 1, 2013 the Cultural Division in collaboration with the National Cultural Council unveiled the Negre Mawon Emancipation monument which serves as a tribute to the maroons that travel along the trails of Dominica evading their would-be captors in search for true freedom. The Negre Mawon Emancipation monument also serves as a reminder to us of our African roots and to ensure that our history remains fresh in our collective memory. The tribute depicts a maroon blowing a conch shell which is how messages were communicated by the maroons in the 18th and 19th century. The statue which stands seven (7) feet tall and was designed by Franklyn Zamore who is a local crafts man on the island has been located in the vicinity of Fortyoung Hotel at the center of Turkey Lane, Victoria Street and Castle Street in Roseau. A symbol of freedom and emancipation.